Palma de Mallorca is the capital city of Mallorca and also the largest conurbation on the Island, being home to almost half of the entire population. The area consists of the main city, as well as many towns, bays and villages which fall within a 10 kilometre radius. Palma is a completely different experience to the rest of the Island. The variety found in the area is second to none, ranging wildly from city lifestyle, to quieter bays, industrial towns and modern marinas and it is wonderful to see the old sitting pleasantly alongside the new. Palma: The Capital City of Mallorca, Palma is situated in a large Bay of the same name and can be divided into three main areas; the Old Town, the New Town and the Port. The Old town is a real maze of narrow, animated streets, crammed full of shops, stalls and curiosities, while the New Town boasts large plazas and wide boulevards. Here you can find all the ‘trendy’ shopping centres such as El Corte Inglés and hundreds of good quality restaurants. The Port is one of the most important in Europe and houses a luxury Marina, as well as the Navel Base. The skyline is dominated by the 13th Century Bellver Castle and Palma Cathedral, a huge gothic structure, begun in 1230 and carved out of outstanding golden sandstone. Aside from the high rise hotels, Palma is modern and refurbished city, with clean lines and excellent facilities, making for a high quality and cosmopolitan lifestyle. It is the cultural and economic hub of the Island and has recently been voted the nicest place to live in Spain. Marratxi: Marratxi is a small industrial town situated to the North of Palma. It is now home to a large industrial site, serving Palma, but is especially noted for its contribution to the pottery industry. 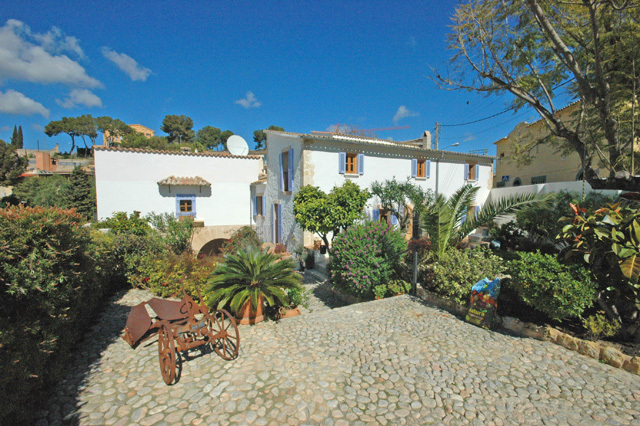 There are many traditional style pottery kilns here and the nearby village of Sa Cabaneta is famed for the production of Siurels; traditional white, Mallorquin figurines, painted red and white and popular amongst tourists. Illetas: At the Western end of the Palma Bay is the sandy beach township of Illetas. It is a more secluded beach area than its busy neighbour Cala Mayor as it is hidden between rocky outcrops and leads up to Costa D’En Blanes, home to Marineland.